Creative IT is specialised in professional and fast data recovery. Our team of skills computer technicians can recover data from damaged hard disks and other computer based media at competitive prices. Our services are available for PC computers, laptops and external hard drives and storage devices. We recover data from all hard drives including Toshiba, Hitachi, Seagate, Samsung, Fujitsu, Western Digital, Maxtor and Lacie. Creative IT is able to offer data recovery services for data loss caused by static electricity, power surges and outages as well as lightning strikes, floods, fires, other natural disasters. We also take care of computers affected by viruses, sabotage, accidents, equipment malfunctions and user error. Logical recovery is necessary when the hard drive data is lost after an accidental deletion or a corrupted partition table or files system on the hardisk. It can also happen after malicious attacks on the system or viruses. If the data hasn't been overwritten, the data becomes retrievable. Our technicians will extract the raw files from the hard drive and rebuild the data. 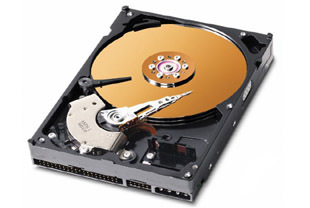 The hard drive firmware is the information that a computer uses to interact with the hard drive. Firmware errors are due to damages and corruption of the hard disc firmware. When this happens the hard drive can become undetectable and requires a repair in order to reach the content on the dive. This can be done using specialised equipment and the data recovery expertise of our technicians. Our accidental data recovery services will help you retrieve data accidentally deleted or data stored on a hard drive that has been dropped or received liquid damage. Our technicians will troubleshoot the state of the drive including the motor, heads and platters and potential damages on the logic board at the back. This will require testing a number of components such as the capacitors, diodes and checking for any burn traces on the circuit board. Once the hard drive is received in our repair centre, our technicians will run a disgnostic on the drive. The start by checking if the drive spins. They will then check for clicking noises coming from the drive. The next step is to run a disk doctor utility to identify the condition of the hard drive. This will allow us to know what type of data recovery is required ie physical or logical. Prices for data recovery start from £79 + vat which includes the basic data recovery service and diagnostic. For more advanced data recovery, prices will vary depending on the time required to recover the data. Average prices for data recovery are £350. To discuss your data recovery requirements, call us now on 020 7237 6805 or e-mail us at info@creativeit.net.